Last year, I had the pleasure of reviewing Scott Vuocolo's Mercer Brigadier. Even in prototype form, I was impressed with its design and functionality. 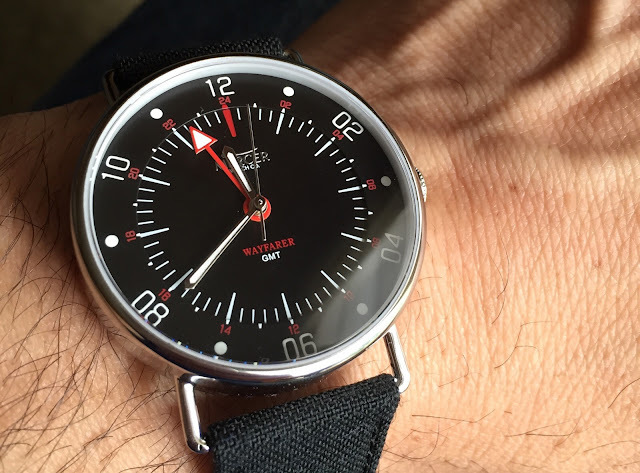 As that project came to fruition (Brigadiers will be shipping soon), Scott turned his attention to a new watch, this time designing a sleek, modern, and very affordable automatic GMT. He calls it the Wayfarer and it's coming to Kickstarter on Tuesday, June 23, at 12:00 noon EST. 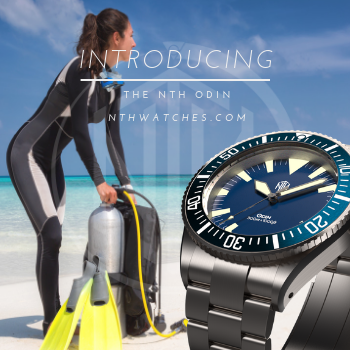 The Wayfarer's round stainless steel case measures 41mm wide, 48mm long, and just 11mm thick. 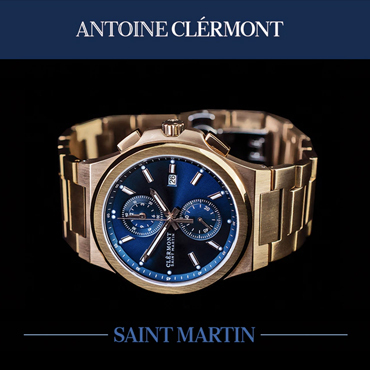 It is a comfortable mid-size that should easily suit most wrists and tuck neatly under a shirt cuff. Wire lugs, a slim bezel, and a domed sapphire crystal give it a vintage field watch look and maximize its modest proportions. 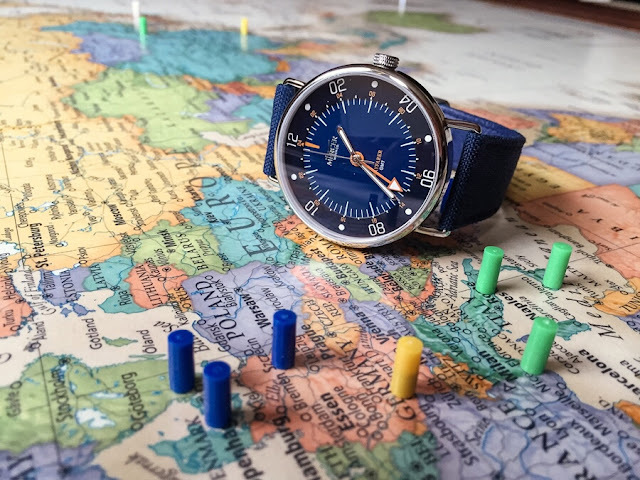 A screw down crown, 100 meters water resistance, and durable Cordura strap with Lorica lining will stand up to the elements, making it a perfect companion for most travel adventures. 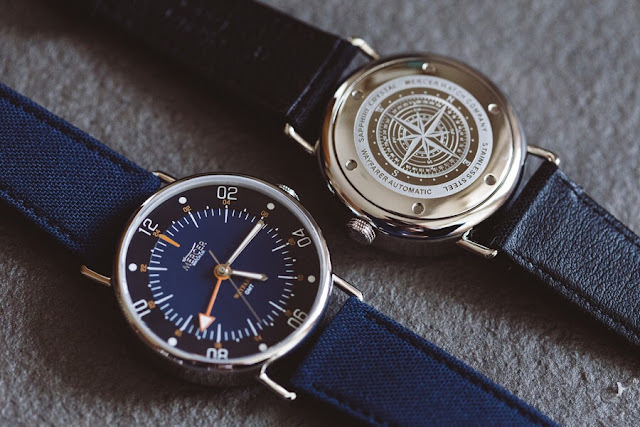 To keep the price reasonable, Scott looked to China for the Wayfarer's movement. He selected a Hangzhou 6460 mechanical that had the same specifications as the Swiss ETA 2836-2 with a GMT module. 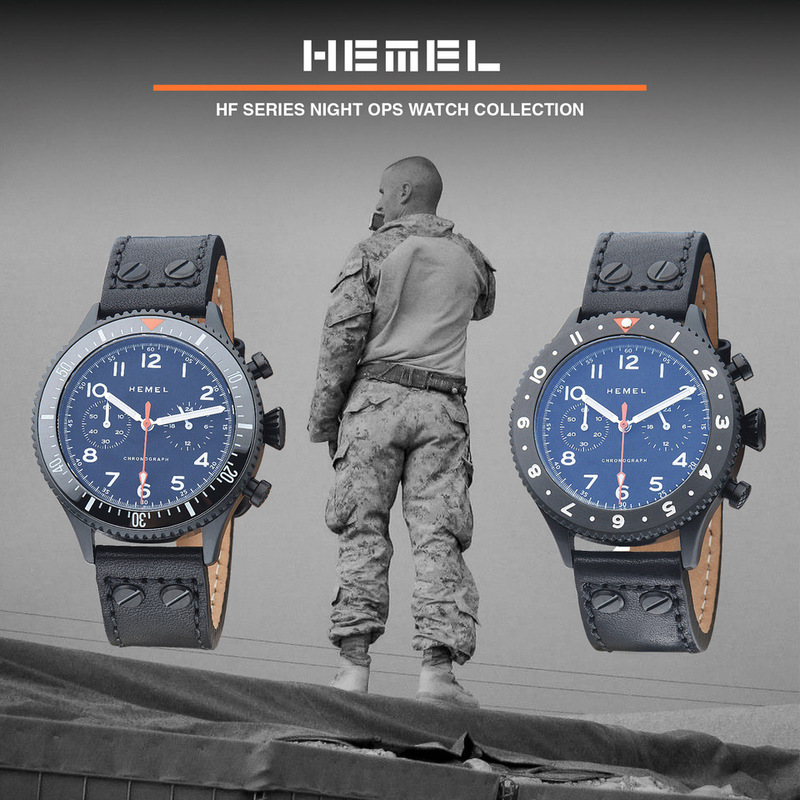 It is 26 jewel unit with a 28.8k bph beat rate, 40-hour power reserve, hacking and hand capabilities and, of course, an additional hand for tracking a second time zone. The dial is a departure from the conservative Brigadier. The Wayfarer has a radial arrangement and wears its minute index on the inside of the dial, along with the 24-hour markers. Minute and hour hands are bat shaped and the GMT hand is a prominent arrow. 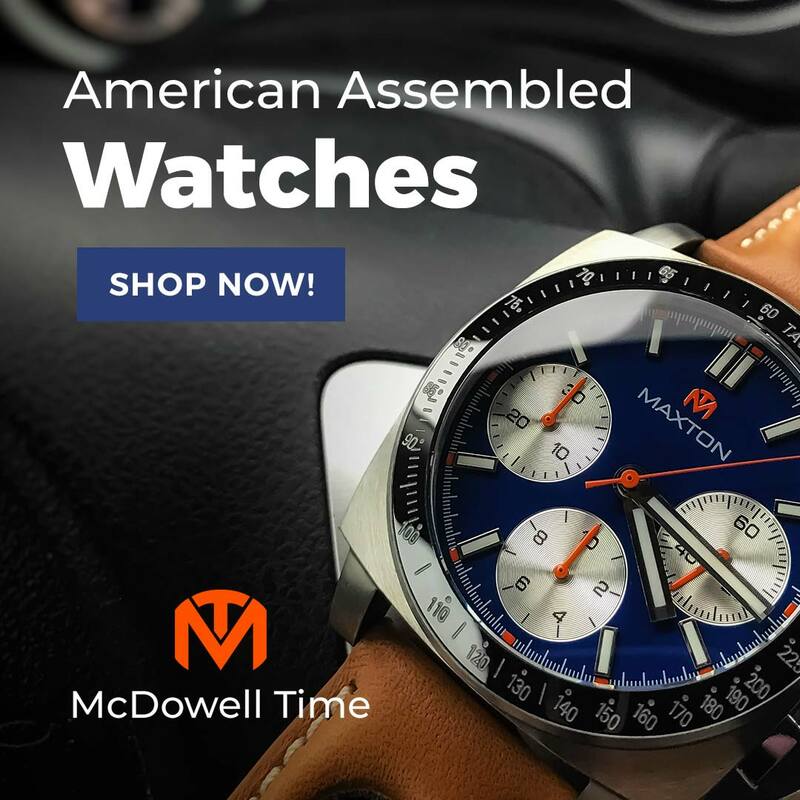 All are treated with BGW9 SuperLuminova for a strong blue-green glow. There will be some changes before production. The outer ring and text will be slightly larger for improved readability, as will the 24-hour ring. The GMT hand will shrink accordingly. It is a sharp looking layout that gets even better as color is applied. Two color ways will be offered: two-tone grey with blue accents, and my personal favorite two-tone blue with orange accents. A black and red version is planned as a stretch goal. Overall, the Wayfarer looks like a winner. It promises to deliver a satisfying combination of retro aesthetics and practical specs for the very attractive early bird price of only $229. 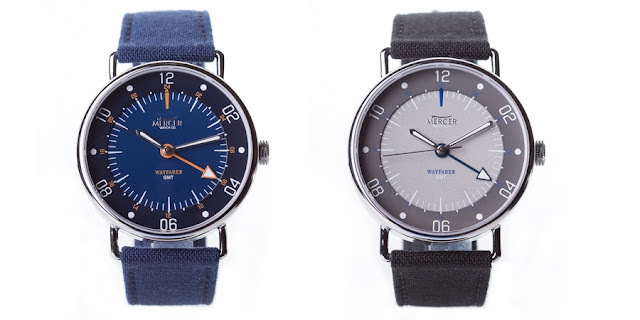 For more information or to place your order, check out the Wayfarer Kickstarter page: https://www.kickstarter.com/projects/mercerwatch/the-wayfarer-gmt-from-mercer-watch-co.